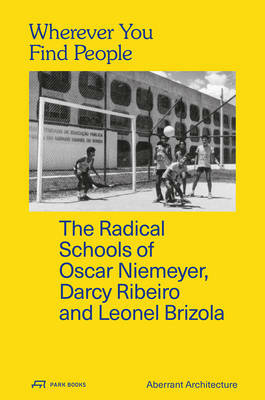 Wherever You Find People captures the compelling story of the Integrated Centres of Public Education (CIEP) in the Brazilian city and federal state of Rio de Janeiro. This unique but relatively obscure experimental educational project is a prime example of socially driven public architecture and a testament to ambition and forward thinking. The CIEPs were conceived in 1982 by Rio's State Governor Leonel Brizola (1922-2004), the anthropologist, author and politician Darcy Ribeiro (1922-97), and the eminent architect Oscar Niemeyer (1907-2012). Today a network of 508 CIEPs covers the entire state of Rio wherever you find people, you will find a CIEP. This new book is based on extensive interviews with key protagonists and richly illustrated with original sketches and annotated drawings from the Oscar Niemeyer Foundation archive, alongside visuals by Aberrant Architecture. It also features new essays illustrating how architecture can embrace the constraints and conditions of the modern world and engage creatively with the reality of today's social, political, legislative and economic boundaries. Wherever You Find People contributes to a wider architectural discourse about the links between education, design and school building.